A young man on the streets is wanted by the law--and a very unusual group of fellow outcasts--in this series that takes the idea of Charles Xavier's X-Men and turns it into something more realistic. First issues of creator-owned projects are always a tricky thing, because you want to tell a strong story but you also have to set up the world for the reader. Remender nails it on this one, using the fact that Marcus is homeless and hiding out as a way to explore the desperation of his world, late 80s San Francisco. Reagan is President and the world is a cold, uncaring place for a displaced youth who didn't want to be in this country in the first place. He's clearly wanted for something, but the details aren't clear. A mysterious organization wants him, too, setting up the big reveal of a teenage assassin school, complete with a secret hideout, quirky headmaster, and rules that Marcus is sure to break. It's a lot to talk about but thanks to strong collaboration with the artists, Remender is able to space out his dialogue with visuals that add to the mystery, taking the edge off the exposition. A ton of tight panels (sometimes as many as 12 by my count) break up the flow of the reading, putting specific emphasis on the lines, as we concentrate on the look or body posture of a character as they deliver a plot point or key decision. It's not Remender's best dialogue, but the art does a lot to help it out while we wait to get to the good stuff. Look at how much those faces tell us! The biggest draw (no pun intended) on this one for me is the art. Craig and Loughridge combine to give this one a distinctive feel. Craig's linework is detailed and realistic, looking like a more restrained Paul Pope. You can see every crease on the Headmaster's suit. In a splash page covered in smaller panels, every drop of Marcus' blood is accounted for, as are the tears from his face ans the tiny flecks of rubble created from a gunshot. Facial expressions drive the action, with a lot of close-ups to see the terror in a cop's face or the calm demeanor of one of Marcus' rescuers. Crag's fine detailing is preserved by the coloring of Loughridge, who works hard to emphasize the details rather than bury them in shading. Eschewing the usual path of coloring everything in realistic tones that you might find in a book like this one, Loughridge feels free to break from the pattern whenever it suits him. Some pages are tinted a dull pinkish red, with everything based on that template. In other cases, he uses dark blues, doing the same thing. Yellow forms the basis for several other pages. I don't know why the creative team went in this direction but it's brilliant. 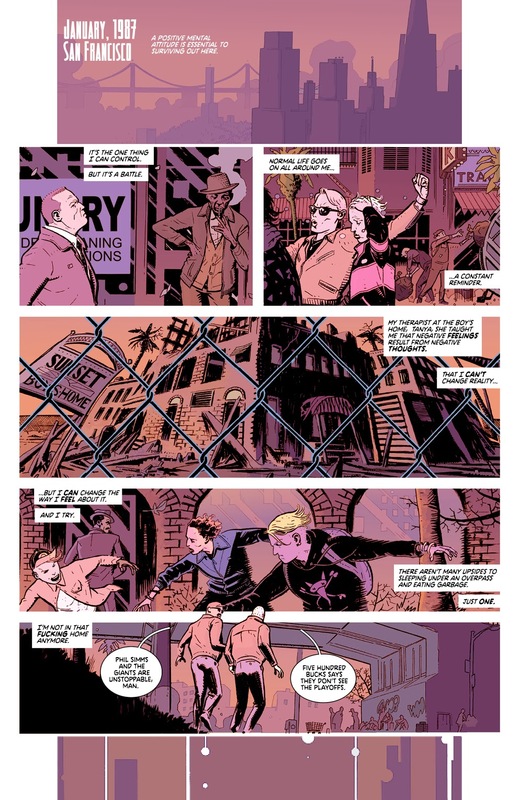 When Loughridge mixes these tones together in a single page (such as when dull plum becomes varying shades of blue), the contrast hits the reader full in the face. Loughridge setting the color tone. The coloring choices take the emphasis off what something should look like and puts the focus on what Craig wants it to look like, which is really innovative. This wouldn't work on a comic where you need the coloring to be standard (like a superhero book, for example), but it's perfect for Deadly Class. The idea of using varying shades like they used to do in 1960s comic books but without barreling over the line art is a really good one, and I'd recommend this one to readers based on that alone. 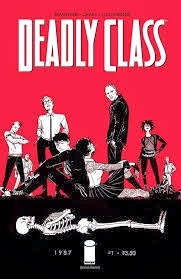 Fortunately, however, there's plenty of other things to like about Deadly Class. We have plenty of mystery (Why were people after Marcus? Who does this league of assassins assassinate? Can any of them be trusted? ), a main character who has a strong voice of disaffected 80s youth, and a premise that's unrealistic and yet grounded in the reality of 1980s America all at the same time. Deadly class is a book you don't want to be schooled on later and is highly recommended.